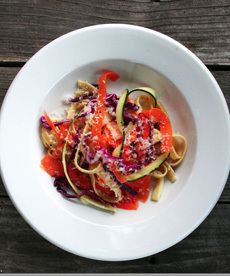 A new look at Pasta Primavera, with shaved vegetable strips. Photo and concept courtesy chef Michael O’Boyle, ChickenFriedGourmet.com. To add more excitement to your cuisine, rethink classic dishes. Tweak their preparation in one small way to make them seem new and different. Here’s a refreshing idea from Chef Michael O’Boyle of ChickenFriedGourmet.com: a different perspective on the classic dish, Pasta Primavera. Instead of cutting the vegetables into coins, matchsticks or other shapes, use your vegetable peeler to create long strips, mirroring the shape of fettuccine. Not only is it visually appealing, but the way the vegetables mesh with the fettuccine makes it easier to eat your veggies. The vegetables should be shaved into 3/8″ strips, or as close as possible to the width of the fettuccine. 2. When the fettuccine is almost finished cooking, quickly steam the vegetables (you can do it in the microwave—check after 15 seconds). 3. In a large bowl, toss the pasta, vegetables and herbs with the olive oil. Season with salt and pepper, as needed. Sprinkle with grated cheese and serve; or allow diners to add their own cheese at the table, as you prefer.